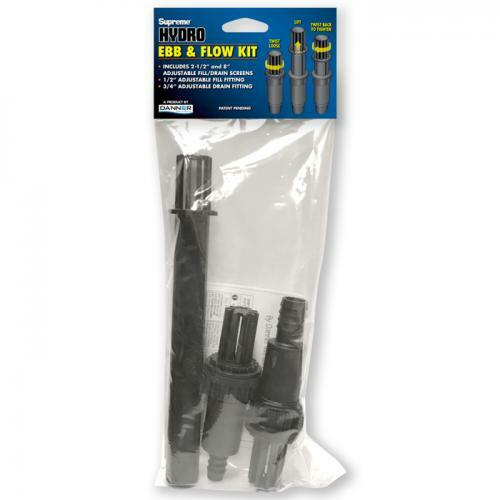 Brief Description: Danner Supreme Hydro Ebb & Flow Kit features an innovative, patent-pending design which makes adjusting the height of your Ebb & Flow fittings easier than ever while bringing convenience to your garden. Simply position the neck of the fill/drain screens to the desired height and then twist to lock into place. This allows you to easily adjust the fill height of the water in the flood table. 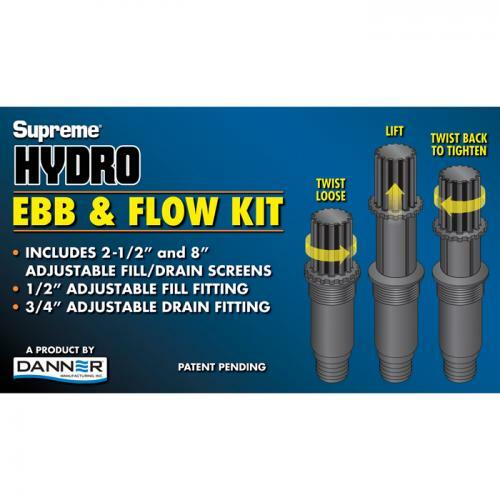 Notify me when "Danner Supreme Hydro Ebb & Flow Kit" is re-stocked. THIS INNOVATIVE DESIGN makes adjusting the height of your Ebb & Flow fittings easier than ever while bringing convenience to your garden. Simply position the neck of the fill/drain screens to the desired height and then twist to lock into place. This allows you to easily adjust the fill height of the water in the flood table.